In Palestine, roadblocks and checkpoints can appear in a matter of hours, or even minutes. 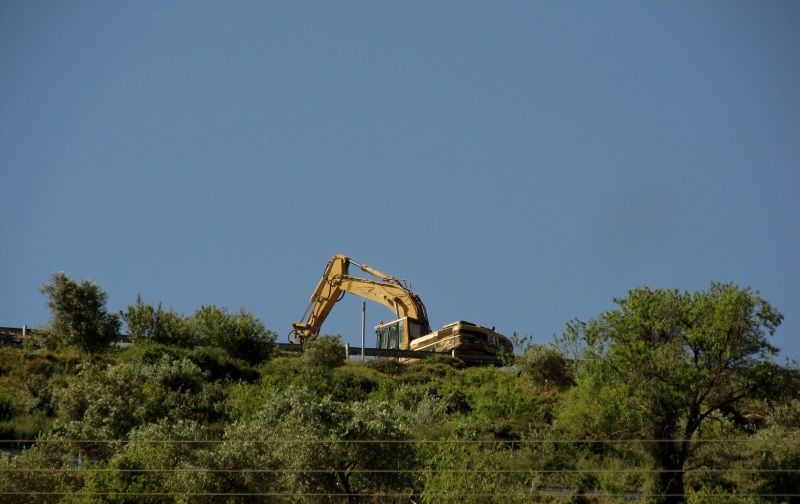 Such was the case yesterday in Luban al-Sharqiya, a small village of about 2,000 residents, that’s perched on a hilltop overlooking Road 60 – the main highway from Ramallah to Nablus. Several concrete blocks and a temporary gate were erected where one of the roads into the village meets Road 60. 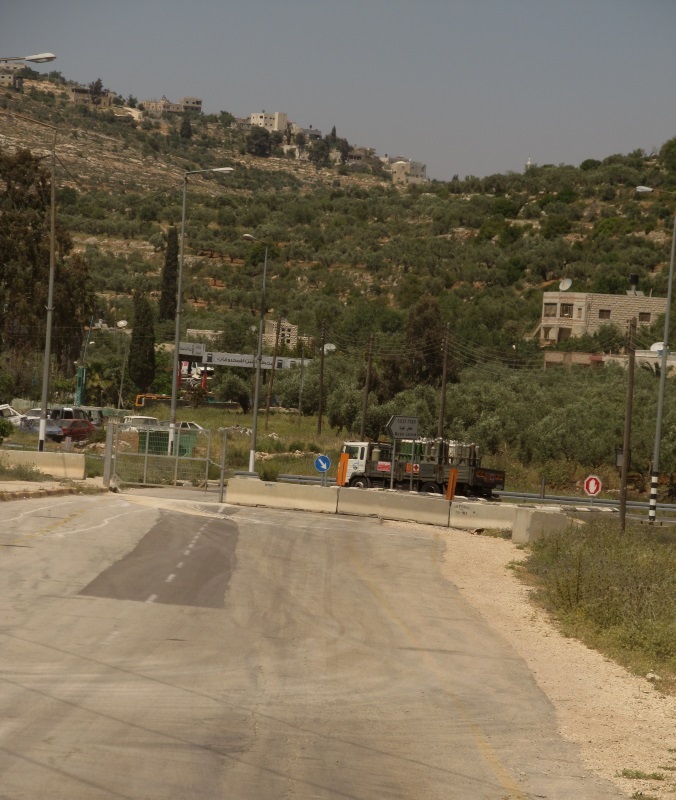 IWPS volunteers observed that an attendant was willing to open the gate for officials and cars with Israeli license plates, but Palestinian vehicles were obliged to take a longer route from the other side of the village. The majority of traffic has been diverted. The road in question was originally built during the Ottoman period, and is used by the village of Luban, surrounding Palestinian homes, and the illegal settlement of Ma’ale Levona. It is said that the winding route of the road was set by having a donkey walk up the hill and then building the road along the path the donkey set. Local farmers have been informed that the closure of this critical road will last for six months, and it is being imposed so that the road can be widened. The widening of the road is a threat to some families, whose houses and stores are located 2-3 meters off the edge of the road. In some places, houses and sheds have been built into the hill next to the road, becoming part of the embankment and serving as soil anchors. The families living in these houses worry that this might be a move on the part of the Israeli occupiers to justify housing demolitions, and have not given their consent for construction to take place on their property. A few short kilometres away from Luban, the villagers of Qaryut have been battling similar road closure for over a year. Qaryut has a main access road that goes from the village to Road 60, as well as farmlands owned by villagers in the surrounding area. In 2013, the road was blocked off, first by earth mounds, then by a permanent barrier along Road 60. Now the people of Qaryut can access the main highway by one of two ways – either via a winding 20 kilometre detour, or by jumping over the barrier and arranging to meet a car on the other side. Those who choose the latter have been threatened with arrest from the Israeli police. This is both an inconvenience – as approximately 90% of the villagers commute to work via Road 60 – as well as a more sinister threat. When roads are closed, accessibility is decreased. The less accessible a piece of land is, the more vulnerable it is to being stolen and swallowed up into an illegal settlement. Since Qaryut is partially surrounded by the settlements, it is especially necessary for this road to reopen, and the surrounding farms to be easily accessible to their owners. For this reason, Qaryut has begun a weekly demonstration – the newest, and currently the most violent, in the West Bank. Road closures – both permanent and by flying checkpoint – are a constant element in the Palestinian daily struggle. Apart from the inconvenience, there is an economic aspect and a safety aspect to this form of harassment. On the economic side, drivers are forced to take more time and fuel moving from place to place, and communities that are cut off from main roads see a decrease in business. On the safety side, ambulances don’t have reliable access to patients. However, the most egregious offense of road closures is the fact that it is done in defiance of the sovereignty those who built, maintained, and use the roads in question – namely, the communities of Luban and Qaryut.